HeadKandy Hair Extensions share their choices for on-trend Christmas hairstyles for this season. This is a super cute look for Christmas and it takes a matter of minutes to create! HeadKandy reveal their top on-trend Christmas hairstyles for hair extensions and give tips on how to create the looks too. For daytime looks, HeadKandy have selected two hairstyles which can be created in just a few minutes, but that look incredible too. Their first style is the tucked side pony. To create this style, HeadKandy advise tying your hair and your hair extensions into a side ponytail, pulling the bobble a few inches down the ponytail to create a gap in the hair, and then tucking the ponytail through the gap to create the tucked ponytail. HeadKandy have selected the topsy turvy fishtail braid as another of their favourite Christmas hairstyles for hair extensions. They recommend fitting your hair extensions to add length and thickness before sectioning the hair. For clients looking for a glamorous evening Christmas hairstyle for hair extensions, HeadKandy have selected the full head extensions. 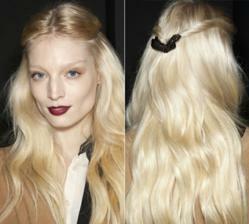 The HK stylists recommend clipping in the extensions lower down on the head in order to hide the clips whilst styling. Finally, HeadKandy have picked the slick quiff as one of their favourite Christmas hairstyles. To create this look, they recommend styling a quiff on the top of the head, leaving the rest of the hair loose while the quiff is being created. Once the quiff is in place, the rest of the hair can be pulled back and pinned near the ears for a sleek look. These Christmas hairstyles can be created with Rosie hair extensions, which can be found on the online shop along with hair accessories, vintage jewellery, hair care products, and hair tools.